Time to be betting on Brown 2011? Will he really stay on if Labour loses? 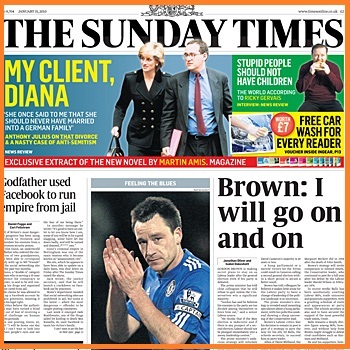 The big story in the Sunday Times has serious implications for several betting markets if its turns out to be correct. The report opens: “Gordon Brown is making secret plans to stay on as Labour leader after the general election even if his party is defeated. The prime minister has told close colleagues that he will refuse to quit unless the Conservatives win a significant majority. The goes completely against the received wisdom that after Labour’s likely fall from power then Brown would slip quietly out of the scene and the summer would be dominated with a contest to find his successor. Many of the thousands of bets that have been placed on the Labour leadership have been made because punters believe that this will all come to a head in the period after the election. Not so – if this latest report is to be believed. If Brown wants to do this then the chances are that he’ll be able to see off any challenges – just in the way he has seen off plot after plot over the past year. One market on this is the Brown exit date market on Betfair. I win Â£500 for a Â£67 outlay if he is still Labour leader on January first next year. Why’s this been pulled from the SkyNews paper review? Is Number 10 trying to contain the Rawnsley damage? Late last night the above front page figured prominently in the SkyNews review of the papers which is available online. A couple of hours later. as reported on the last thread, PBers linking to Sky found that the Mail on Sunday’s story had been taken down – see here. Fortunately I had done a screen grab of the SkyNews paper review at 10.34 pm before that happened and that is what I reproduce above. So what’s happened? Has there been a big operation to limit the damage from the story which reports that a new book by Andrew Rawnsley is going to make sensational claims that “Gordon Brown has physically attacked his staff in a series of outbursts in Downing Street – and once in America ….”? Whatever the veracity of the allegations they are the last thing that the beleaguered PM needs in the run-up to a crucial general election – and who could blame his team from doing everything possible to limit their impact? Brown Central’s influence does not seem to extend to the PoliticsHome site where, as at 0620 the front page was still featured. I doubt, also, whether it has impeded distribution of the printed version of the paper. This is from the paper’s report: “Well-placed sources say the Prime Minister has been accused of hitting a senior adviser, pulling a secretary out of her chair and hurling foul-mouthed abuse at aides while distraught over an alleged snub by President Barack Obama. The claims, which are fiercely denied by Mr Brown’s allies, are linked to a new book about Mr Brown by respected political journalist Andrew Rawnsley. One of the problems with Brown’s style of politics is that you can make a lot of enemies on the way and often people don’t forget. 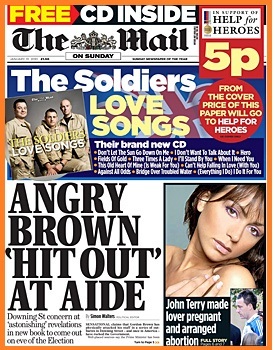 The massive danger for Labour is that rightly or wrongly Brown’s character could develop into an election issue. The more there is to fuel it the worse it can get. Also in the Mail on Sunday is a “poll” from BPIX – the pollster that refuses to make any details of its surveys available and does not follow the transparency rules of the British Polling Council. The fieldwork is carried out by YouGov and the numbers, C39-L30-LD18, are in line with other two YouGov polls that we have seen this weekend. But has Labour reached its ceiling? Is 30% (+MoE) the limit in the current climate? Two events inÂ Spring 2009Â gave minor parties a massive boost in the polls. One was the coverage and electoral opportunities afforded by the European elections, the other was the disillusionment with the Conservatives and Labour that resulted from the expenses scandal (the Lib Demsâ€™ poll rating was largely unaffected). After polling around 10% throughout winter 2008-9 with all firms except Comres, who put them a couple of points higher, Others shot up to be regularly reported in the high teens or twenties from mid-May to mid-July. While itâ€™s difficult comparing across polling firms and stripping out other effects going on, the best guess is that theÂ gain for Others came from a net four point drop for the Tories and a seven point loss for Labour. Those movements in voter intention now look to have almost entirely unwound; yesterday’s Mori and YouGov polls giving further evidence of that. Others are still polling a little above the 10% they were usually recording a year ago – especially with Angus Reid, though thereâ€™s no comparable early 2009 data for them – but the voters the two big parties lost look to have mostly returned â€˜homeâ€™. That, however, leaves Labour with a problem if theyâ€™re to stop the Tories forming the next government or even prevent them winning a majority because a 30% share is really not enough if the Tories areÂ on around 40%, and having regained what they briefly lost to Others, the remainder looks like a much tougher nut to crack. Friday’s Angus Reid poll included a subsidiary question to respondents who indicated a voting intention of UKIP, Green or BNP, asking how they would vote if there wasnâ€™t a candidate of their preferred party standing in their constituency. Just 4% nominated Labour against 13% for the Tories and 16% for the Lib Dems. Fully 65% were unsure, would not vote or would vote for a different (unspecified) minor party. Those are pretty measly numbers for the big boys (and especially Labour) and would indicate a strong anti-politics or anti-establishment feeling among the remaining UKIP, Green and BNP voters (Plaid and the SNP are a different case but there are few Con/Lab marginals where Plaid or the SNP will be significant players). If Labour runs a strongly negative campaign, itâ€™s difficult to see those voters being attracted back into the red corner – and negative politics seems to be Brownâ€™s style. Of course, what really matters is not so much the Labour share as the gap between the Conservatives and Labour. If Brownâ€™s teamÂ knocks a few points of the Tory score, even if it goes elsewhere, it will benefit them – though it would be a pretty inefficient way of doing it. Thatâ€™s academic though unless they can do it, and apart from during a media shutout as during the Labour and Lib Dem conferences, Cameronâ€™s Tories have been pretty invulnerable to those sort of attacks. Itâ€™s been self-inflicted wounds like expenses or Lisbon that have caused the longer dips in the Tory ratings. So is it all over bar the voting? Not yet. During Brown Bounce II (the Banking Bailout), Labour took vote share from both the Tories and Lib Dems. If theyâ€™re going to get consistentlyÂ beyond 30%, theyâ€™ll have to do so again. In fact, in yesterday’s Mori poll, that’s exactly what happened (YouGov had a Tory decline rather than a Labour advance).Â Why that happed is crucial: was it a deep-seated switch orÂ a short-term reaction to (for example)Â the release of an economic statistic?Â If the latter, Labour’s best hopes still rest onÂ Cameron, Clegg or their respective teams going quiet or shooting themselves in the foot. Will this ease the jitters at Cameron Towers? So for the third YouGov poll in a row the Labour shares stays on 31% while the Tories recoup the two points that were lost in the overnight survey. There’s not a lot to say more than that – it’s all within the margin of error – but this is about “The Narrative” and that has Cameron’s party back in the 40s. This is all warming us up for the election campaign itself when there’ll be several polls a day. Is this the day to sell the Tories? Have the markets got them priced too high? There’s been little reaction overnight on the spread-betting markets to the YouGov and Ipsos-MORI polls with Conservative leads of 7% and 8% respectively. These are gaps that take us firmly into hung parliament territory – a situation that’s reached with a Tory seat total of 324. Compare that with the spreads above. 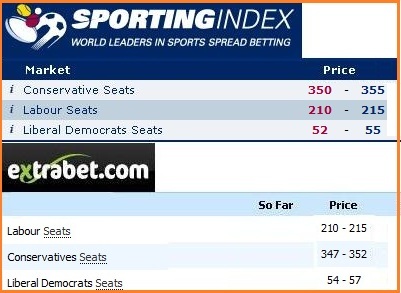 SportingIndex at 6am had a range of 350 – 355 seats which is well above the hung parliament threshold and the seat total suggested in the two polls. I’ve had my first main party spread bet for months with a sell of the Tories at 350. The media narrative is likely to be shaped by these two surveys much more than the PB/Angus Reid poll which still has Labour on 24%. It might be that the latter is getting it closer but if you bet to trade like I do it’s market sentiment that matters. Labour’s problems in all of this are the desire for something different and the continued unpopularity of Mr. Brown. ICM only a few days ago had 66% saying it was “time for change” with just 25% agreeing that “Continuity is important – stick with Labour“. In the MORI approval ratings Brown has recovered a bit on December but is still down on November and has a double digit deficit compared with Cameron. The betting is going to be driven by the polls and if it is anything like last time then ICM and YouGov will be the ones the markets take note of most. Could YouGov be the poll that prompts an early election? The third of today’s polls, from YouGov for the Daily Telegraph, has the Tories down below the 40 mark at just 38 points – only seven above Labour. If that was the margin on the day then we would certainly expect a hung parliament with the Tories as the biggest party. Of all the polls that we’ve seen in recent months this is the one that will most worry the Tories. It’s from YouGov and will have a dramatic impact on the narrative and should put some real heart into Labour. Maybe this will just encourage Brown to go early. Maybe – for he might never have a better chance. 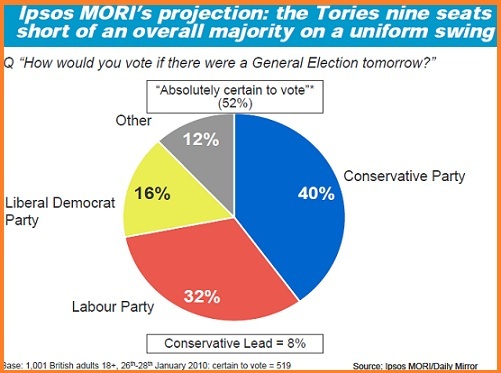 There’s another huge swing in the MORI poll for January that has just been published. This was carried out last weekend but is only being published tonight for tomorrow’s Daily Mirror. So if Angus Reid are seen as the totally stable pollster with hardly any variations at all then Ipsos-MORI is the opposite. The poll is actually quite old and was completed on Sunday – two days before Angus Reid started. The fieldwork took place from Tuesday to Thursday. Certainly it shows a very different picture and will keep the hung parliament narrative going. What seems to happen is that the Lib Dem share seems to be crucial. When that goes down Labour goes up. MORI is the only pollster that does not embrace some measures to ensure a politically balanced sample. It also only shows those 100% certain to vote in its headline figures. So there you are folks – the incredibly turbulent MORI or the boringly stable Angus Reid. Can we get consistency on the 2005 notionals? Shall we now stick with Press Association’s “official list”? 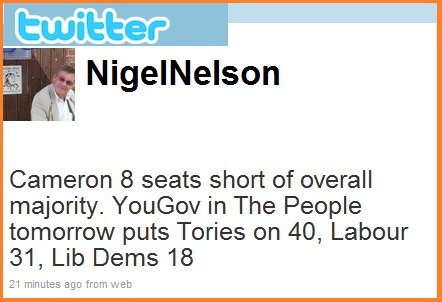 As I’m sure most PBers will know the next election will be fought in England and Wales on new boundaries. That’s fine except when we try to predict seats for betting an other purposes we need to know what happened last time. And here we can run into some massive confusion because there are at least three sets of 2005 notionals available online and they can all be showing very different figures. 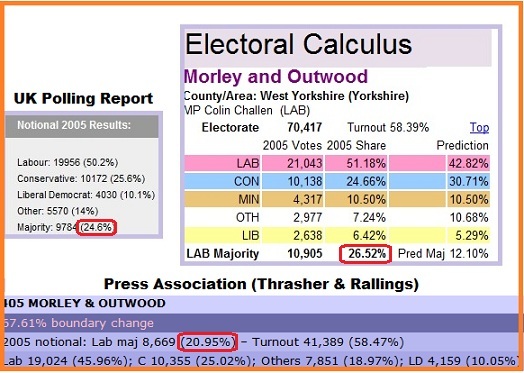 Take the popular betting seat of Morley and Outwood in West Yorkshire where the leading Labour minister and likely leadership contender, Ed Balls, is trying to ensure that he’ll continue to be an MP and we get three very different 2005 outcomes. Just look at the different notional majorities above. Electoral Calculus has it at 26.5%; UKPollingReport at 24.6% while the official Press Association list, compiled by Thrasher and Rallings, has it at just 20.9%. There are dozen of examples like this but I’ve chosen the one from the seat of the ambitious Children’s Secretary. For the future on PB my intention is stick with the official PA list. This will be the one that the media will use and should avoid confusion.